I’ve been on the South Beach diet for almost a week now, and I’ve already dropped five pounds. (If my fancy scale is to be believed, which it probably isn’t, my body fat is now 8.0%.) If my goal here were the normal one (i.e., lose weight), I’d be making great progress. But my only goal is actually to get off this diet, and gain back the five pounds. This would seem to be a simple matter, but it’s not. What brought about this state of affairs? In this post I will explore the strange concept of secondhand dieting; the South Beach diet; the Starch King diet; and a few other diet-related subjects. A secondhand diet is where your spouse, who does most of the cooking, goes on a diet and prepares family dinners according to her new culinary palette. Gone are the glorious lasagnes, fried chicken with heaps of mashed potatoes, and spaghetti alla puttanesca; now she’s serving steamed vegetables and poached fish. Shared family dinners are important to you, and—not wanting to set a bad example for the kids—you cheerfully eat what you’re served. Sometimes you sneak in a low-key post-dinner snack like a PBJ, and/or raid your kids’ leftover Hallowe’en candy, but just as often you get caught up in the post-meal machinery of the household and end up with but a fraction of your normal caloric intake. Voilà! You’re a secondhand dieter. This is how I have found myself on the South Beach diet. My wife Erin has started it up, in earnest, and has requested that I do my normal starch-bomb eating outside the home, at lunchtime. That way I’m not testing her resolve with huge batches of pasta sitting around begging to be snitched from. But I’ve had the flu for the last week and thus have scarcely left the house, so I’m leading a strangely pasta-free existence. Since I started this diet, most nights I dream about glorious starchy food. Two nights ago it was pizzas and pastries—kind strangers were handing them to me, one after another. A couple nights before that I was woken up out of a deep slumber by the sound of my cough drop clattering to the hardwood floor: I’d actually tried to bite something in my sleep. 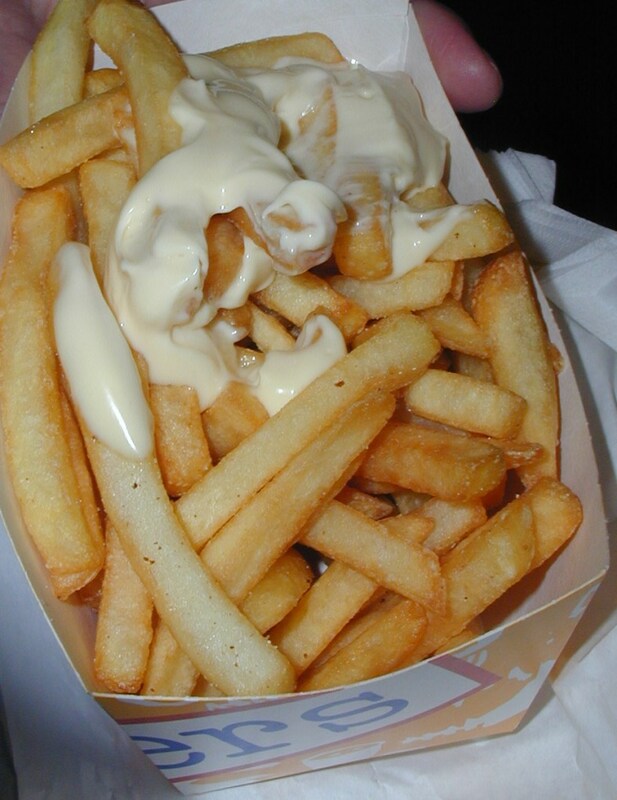 Just look at those damn fritjes. Glorious. Fries figured in to last night’s dream, my strangest starch dream yet. In this one I came across my daughters and one of my nieces eating a big pile of “Lite Burrito,” a (fictitious) tortilla-less burrito from Burger King. There were so many things wrong with that scenario I didn’t know where to start. I was thinking of shutting down their party until I saw their side of fries, which I took for myself. Burger King fries are the most tampered-with of all the fast food chains (the potatoes are coated in a starch batter before frying), but I ate them and they were good. That’s right … dream on! It hasn’t been easy going to bed kind of hungry and dreaming, and daydreaming, of food, but I can’t hold anything against Erin. After all, I’m not exactly an innocent victim of this kind of situation. For fifteen years I’ve been a bad influence on my wife, always wanting to cook (or wanting her to cook) rich, high-carb foods, or taking the family to some Mexican or Italian restaurant that serves huge portions. When Erin and I were courting, we’d often go to Zachary’s and split a large stuffed deep-dish pizza that’s supposed to serve 4-5 people. (I’d have five slices; she’d have three.) When I cooked her a pasta dinner, I’d unthinkingly serve her up a cyclist-sized portion, and she’d end up eating it. As a result of my influence she quickly gained ten pounds, which she has now resolved to finally shed. In high school, I decided (for no reason I can remember) to write my English class term paper on fad diets. My research didn’t endear me to them, and over time my opinion hasn’t changed. I hold particular contempt for the Atkins diet. (I trust the opinion of the American Heart Association that Atkin’s own heart attack was caused by his diet, and I still buy into the USDA food pyramid, with carbs being the foundation.) But the South Beach diet, despite its catchy name and widespread success, seems to be based on sound principles. Even in this first phase, the diet allows you all the carbs you want, with one important caveat: they have to come from vegetables. So dinner goes something like this: you eat some London broil with mushrooms, with and a side of okra and squash. After finishing a generous serving of okra, your jaws are so tired, and your palette so bored, that you just feel like stopping, so you clear the dishes and get on with your life. As this behavior substitutes for getting unnecessary second and third helpings of something relatively unhealthy like macaroni and cheese (damn, I just drooled at the thought), you lose weight. Get the pasta water boiling. Glug a bunch of olive oil in a hot pan and add diced onions. Sizzle those awhile, then add two 17-oz. cans cream style corn. Bring this to a boil and add a 7-oz. can of green chiles, diced. Reduce the heat and boil this awhile to get rid of the excess water. Boil the pasta (something long like linguine or spaghetti). Grate a bunch of cheese into the corn goo: cheddar, jack, mozzarella, whatever you got. Drain the pasta and mix it in with the goo. Eat it with salt and a little Crystal sauce. I can’t recommend this eating style to anybody else, though most of my cycling club pals are on this diet or something similar (e.g., Starch King With a Side of Bacon). So far, I have to say that for Erin and me, the South Beach diet is actually not that hard to stick to. Vegetables really do give the stomach a full feeling, and they are slow to digest so you don’t need to snack much. The greatest hurdle is probably psychological. I do feel hungry much of the time now, as does Erin, but hunger isn’t actually that bad a feeling, if you can get past the anxiety it produces. I think we’re all hardwired to fear starvation, which is why hunger is such a powerful force. Intellectualizing the experience and reminding myself that I won’t actually starve takes care of the fear, and the suffering is no worse than what I subject myself to on the bike. Last night I was enjoying a New Belgium Mothership Wit ale, in a festive short-stemmed beer glass, and Erin approached with something like hostility. “That beer is tempting me more than anything has so far,” she said severely. Fortunately I have a (mostly useless) talent for chug-a-lugging, and I slammed the beer down in about a second. Thus marital strife has been avoided, and I’m one step closer to getting off this diet…. Dana, John (my boy, 16, for you non-Dana's out there, if there are any of you) can really chug. I like to think that I can out-chug him, though in reality, I don't think I can. In fact, I'm almost afraid to "race," because it'll probably just end up being another thing to add to my list of failures. "Cant' beat the boy at chugging." Right under, "Can't beat the boy up the mountain on the bike" and all those other things, "Can't beat the boy a basketball, Ultimate, ping pong, etc." He only chugs water, of course, though I fear the day, if there is such a day, that he discovers that chicks love a guy who can chug beer, if that's even true. Now why would chicks dig a guy who can chug? What's the evolutionary advantage of that? They get drunk and abusive quicker? They get fat faster? Anyway, have fun with your diet. Sounds like a real pleasure!